Want to have a handmade personalized dog magnet? This adorable dog magnet would be a great addition to your fridge or a great gift. 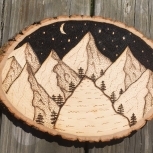 This is a unique gift and decoration that resembles a loved pet through wood burning. 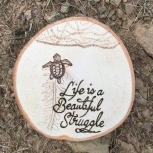 This custom order is on a medium birch, maple, or cherry wood slice measuring approximately 3 to 3.25 inches in diameter (choose which wood you want in the options section). 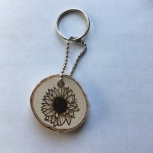 All natural wood with natural bark border and a magnet on the back that is strong enough to hold one or two sheets of paper on any magnetic surface. 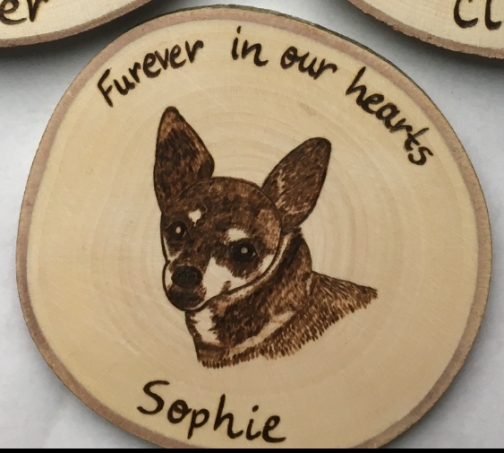 Just send me a photo of your pet that you'd like to have on the magnet through the Etsy conversations. Include anything you'd like on it like your pet name, year, borders, any quotes, etc. 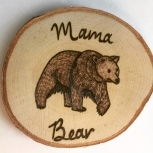 Once I have the photo and things you'd like on the magnet, I'll send you a photo of the sketch to make sure it's exactly what you'd like before burning because once I burn I can't make any changes. Then when that is to your liking I will burn and send another photo of the finished product to make sure you don't want any other additions. The $14.99 price includes one dog portrait, name, quotes, year, paw prints, borders, etc: whatever you want! 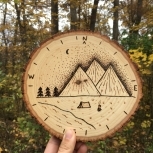 The photos in this listing features some of the custom dog orders I have done either through Etsy or from craft shows. Be creative! Please note that the shipping times may vary on this order due to conversation response time and changes that may need to be made. 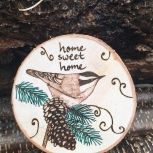 The more changes, the more time it takes so it is possible that this listing could take more than a couple days to ship out. Also note that wood varies in shape, size, and may contain knots.